Can you say three Mid-Atlantic Emmy Awards? 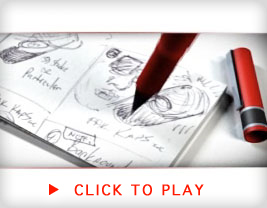 Let us wow your audience with high-end motion graphics and 2D/3D animation. Spit Digital Creative is your team. We not only provide these services for video, but also for the web, multimedia presentations, DVD authored interfaces, PowerPoint and more. We will go above and beyond your expectations. We pride ourselves on our award winning motion graphics and green screen capabilities and recognize them as a unique part of our post-production services. We guarantee our animations and special effects will improve the overall production value of your project - every project. What an incredible experience working with the C&Z Construction marketing team. They wanted to create a custom live action experience with animated characters to explain their insurance process and how it works for their customers. Shooting green screen and digitally composting the on camera talent with our custom C&Z characters was the technical approach to accomplish this successful marketing campaign. C&Z knows the loss of your home or business is an emotional and difficult experience & their goal is to help you by reducing hassle and maximizing your financial recovery for your family or business. We at Spit Digital Creative had the privilege to work with Lisa Ramirez of Ramirez Productions on her Four Seasons Sunrooms media campaign. 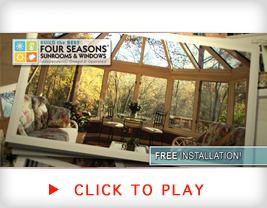 Lisa wanted two :15 broadcast television spots featuring Four Season Sunroom quality products and promote their affordability and FREE installation. For nearly a half of a century, Four Seasons Sunrooms has been dedicated to developing state-of-the-art sunroom design and innovation. From glass to frame, only the highest quality materials are used in the company’s sunrooms, conservatories and patio rooms. Four Seasons’ exclusive CONSERVAGLASS keeps you warm and comfortable in winter and cool and fresh in summer.